Piedmont Avenue is a bustling neighborhood of trendy restaurants, coffee shops, etc. in Oakland. Piedmont Grocery, a neighborhood grocer has been there for over a hundred years and carries a few items that is hard to find elsewhere. Piedmont Avenue is also the street where Fentons Creamy is located. It’s been several years since I have eaten at Bay Wolf on Piedmont Avenue. Whether it was a business lunch or a special occasion, I remember when it was thee place to go in the area. 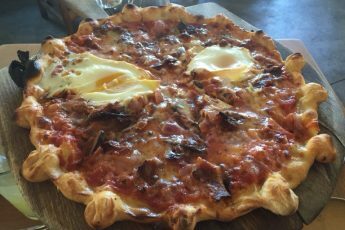 Restaurants on Piedmont Avenue have come, others have gone, but Bay Wolf remains. My food club visited a couple of weeks ago. It also happened to be Restaurant Week so there was a deal of three courses for $30 which I participated in. 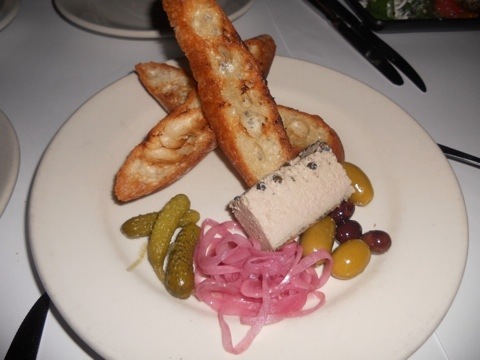 Amongst the three of us, we decided to share the duck liver flan with grilled Acme bread, cornichons and olives to start. The creamy flan on the crispy bread was delicious. This was a nice appetizer to share because it is not only full of flavor, but I suspect full of calories. The appetizer included in my three course meal was a citrus and celery root salad with ancho cress and tapenade toast. 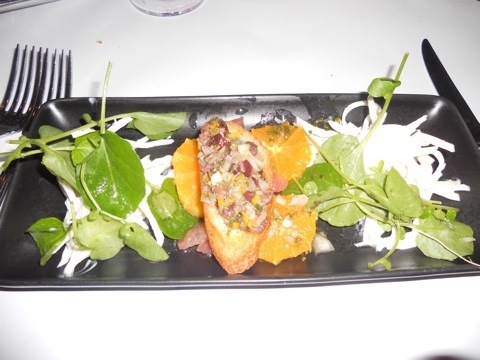 The salad portion of this dish was really nice, but I could’ve cared less for the tapenade toast. Well, maybe if I didn’t eat the duck flan I might’ve enjoyed it more. 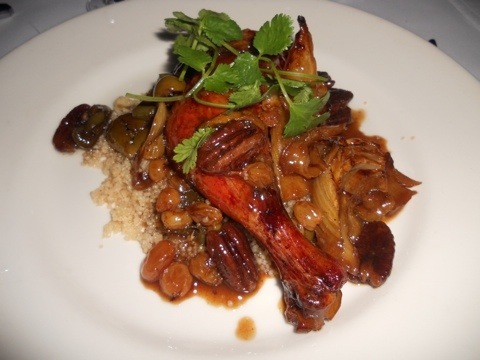 My entree was the Moroccan-style chicken tagine with spiced couscous, olives and preserved lemon. I enjoyed this dish particularly the chicken, but I think the sauce was a little too salty. 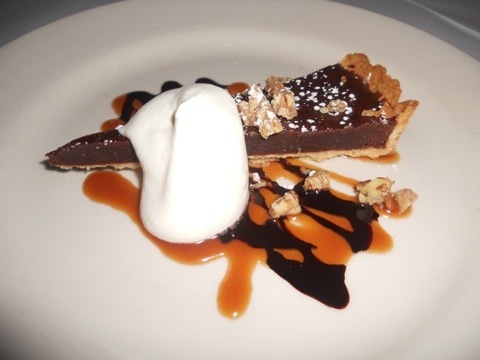 The dessert I ordered was the chocolate-caramel tart. This was fantastic! The blend of chocolate, caramel, whipped cream, and crust was delectable. It seems this dessert is on their normal menu and I would order it again. After all these years, Bay Wolf continues to serve good food in a nice atmosphere.